The Acer Aspire VX 15 is a perfect gaming laptop that offers excellent performance at a budget. Besides ensuring a smooth gaming experience, this laptop is also very efficient in everyday use. Whether you are working on spreadsheets, word documents, or just watching movies, this machine is designed to handle a wide range of computing tasks. Here are some of its features. With a 7th generation Intel Core i7-7700HQ processor that can easily clock 3.8GHz, the VX 15 puts up an impressive performance. The laptop comes with 4GB Nvidia GeForce GTX 1050 which blends well with the Core i7-7700HQ processor for an outstanding performance. Although the GPUs are not very efficient for virtual reality, this machine has the necessary muscle to run an advanced game with 60 frames per second. Over the years, Nvidia has emerged to be one of the best manufacturers of graphics cards. When you consider the gaming industry, Nvidia’s GeForce cards are highly rated for their outstanding performance. Despite the stunning resolution, the graphics card is finely tuned to ensure battery economy. The Acer Aspire VX 15 has a 15.6-inch screen with a Full HD capability and an IPS matrix. With a resolution of 1920 × 1080 and an aspect ratio of 16:9, you should expect a clear display. Besides, this display qualifies to be a “Retina Display” when the viewing distance is greater than 60cm. The laptop comes with a memory of 16GB DDR4 SDRAM which is double the memory considered as the standard for a gaming laptop. In addition, the 16GB 2,400MHz RAM is more than enough for most tasks that you’d want to carry out. With an internal storage of 512 GB, you’ve got more space to store your files and videos. However, you can install an extra 1TB HDD on the 2.5” drive bay. This is a useful feature if you have lots of games to store on the computer and feel that 512 GB will fill up fast. For fast connection speeds, the Acer Aspire VX 15 has an inbuilt ac WIFI card. But to exploit this feature to the maximum, you could get a wireless router that is compatible with 802.11ac WIFI. In addition, you can connect several other devices through the Bluetooth 4.1 technology. This computer has several ports to take care of gaming as well as other needs. Here are some of the ports on the laptop. The keyboard is spacious and the number pad is small. When using the keys, you will realize the balanced travel distance with an impressive response. The whole keyboard has a red backlight and there is some extra illumination around the WASD keys. Overall, this keyboard is ideal for fast typing as well as smooth gaming. And you will love the practical backlight when working in areas with little ambient light. The multi-touch pad is designed to support a number of smart gestures. Although it feels quite comfy, it would have been better if it was bigger and the palm rejection can be improved. It comes with two well-styled fan vents which are very effective for cooling and they also add a unique touch of style to the design. The copper fans increase the efficiency since there’s more heat transfer from the CPU and GPU to the fan vents. Unlike plastic fans, copper is suitable for laptops designed for heavy use. This way, the machine will maintain the ideal temperature even when it’s under heavy use. The Aspire comes with 52 Wh battery which is not very impressive considering the size of the laptop. However, you can easily work for about 4-5 hours when focusing on normal daily tasks. But for gaming, the battery lasts one hour and some minutes. You can make a few tweaks on the GeForce Experience App to achieve longer battery life. For instance, you can tune the settings to achieve 4 hours and 35 minutes of browsing while also working on word documents. It takes around 2 hours to fully charge the battery. It has two speakers at the front and they are average in sound output. For its class, the quality coming out of the speaker grills is quite impressive with a decent bass and Mids. It has a windows 10 operating system and you can start having fun right away. It has a well-thought design and a very solid build The display will use PWM from 0-99% of screen brightness. However, you can fix this with the Health Guard profile. The Acer Aspire VR-15 flaunts an attractive but aggressive design which creates an impression of a pimped-up gaming laptop. Like its competitors, it uses a high-performance processor, as well as the industry respected Nvidia GeForce graphics card. Besides the high-end processor and graphics card, the IPS display delivers a better experience than its TN counterparts. Especially for gaming and multimedia, this display offers perfect contrast and viewing angles. Judging from the details highlighted above, this laptop is well positioned to compete with others in its class. However, the specs and performance are at par with its competitors and there are no major aspects that can set it apart. Nevertheless, the Aspire VR 15 beats all its competitors when it comes to the price. 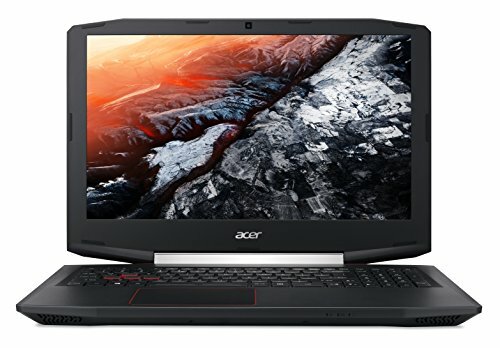 Typically, none of the alternative laptops are as cheap as this one and it’s obvious you’ll be getting great value for your money. To sum it up, there’s high competition between laptops in this segment and that means you could get a good deal if you like discounts.